Bukowskis is pleased to present a theme auction with weapons and militaria. The demand from clients in Sweden and international is huge and we are dedicated to create a market place for collectors of antique weapons and medals. The theme auction includes several antique shooting weapons among them a pair of flintlock pistols for an officer from the empire kingdom made in by the most premier family that produced pistols in France, Le Page. We are also selling two Colt revolvers in the model 1860 Army, whereof one of them been delivered to the arsenal in Bridesburg Pennsylvania in the middle of incinerating civil war – the pistol itself is a history lesson. We can also present a selection of knives. Knife making has a long tradition in Sweden and this theme auction can offer many examples of modern knives in absolute top condition where several of them have won prices for its exquisite work of art. A contemporary knife by Andrzej Rybak. 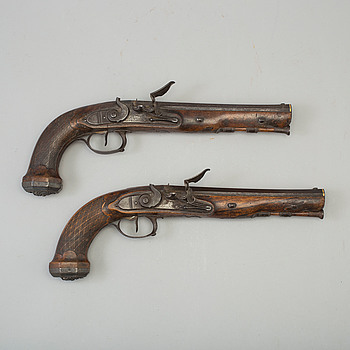 A pair of french officers rifled flintlock pistols by Le Page circa 1810. A Swedish lance 1851 pattern. 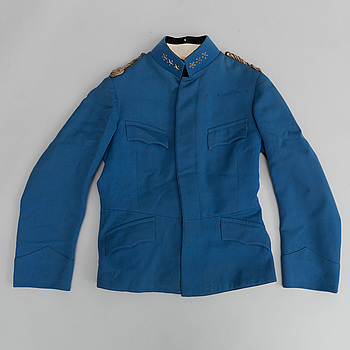 UNIFORM, svensk, m/1888 för officer i Intendenturen. 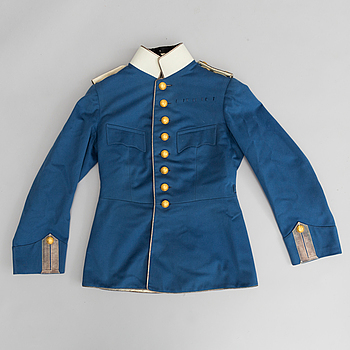 A Swedish artillery officers uniform 1873 pattern. 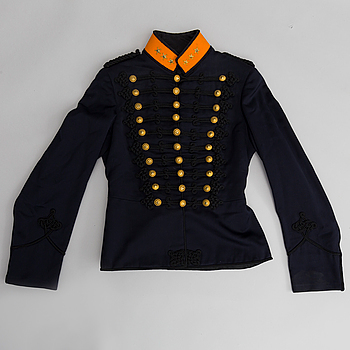 A Swedish cavalry officer's uniform 1895 pattern. 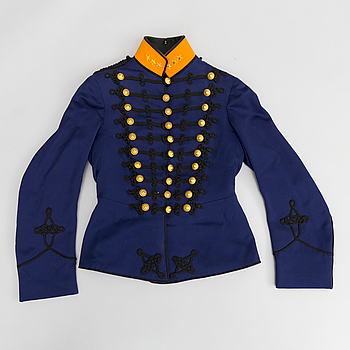 A Swedish uniform for av Dragoon officer 1895 pattern. A Swedish uniform for an Artillery officer 1873 pattern. KOLLETT, m/1871 för kavalleriofficer, med väst. Polonia Restituta, neckbadge and Order of the White Rose, Finland breast badge. A Swedish percussion pistol 1854 Navy pattern. A Swedsih sword 1810 pattern. A conemporary knife by Andrzej Rybak. A Britsih flintlock pistol marked Gatehouse, Portsmouth. 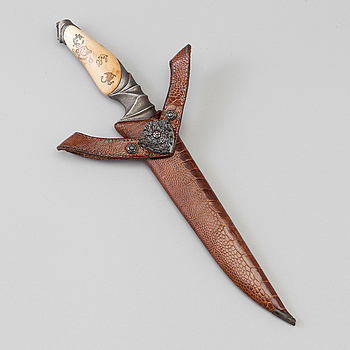 An early 19th cnetury German officers sword by Schimmelbusch. A pair of Queen Anne flintlock pistols makers mark Barker and London proof marks. A knife by Andrzej Rybak. A percussion Colt 1860 Army, no 90473. A Swedish word 1810 pattern. 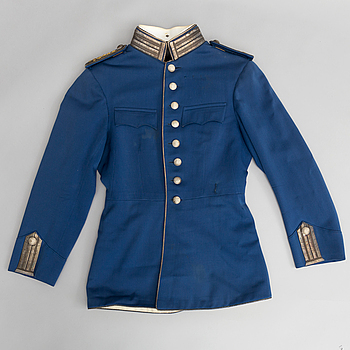 A Swedish uniform for an infantry officer. A Belgian flintlock pistol circa 1800. A 19th century double barreled percussion pistol. 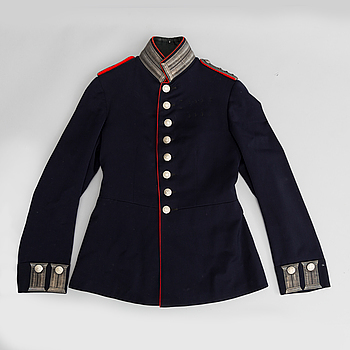 A Swedish fortification officer's uniform 1888 pattern. 2 Swedish end of the 19th century brass percussion revolvers. A second half of the 19th century four-barrel Swedish brass percussion revolver. VADSTENA ADLIGA JUNGFRUSTIFT, emaljerat tecken. A Swedish percussion rifle 1845 pattern with bayonet. A kindjal shaped knife by Adrzej Rybak. A Liege-marked 19th century double-barreled percussion pistol. A Swedish infantry officer's sabre with scabbard. 2 pewter beakers by Firma Svenskt Tenn" dated 1930. 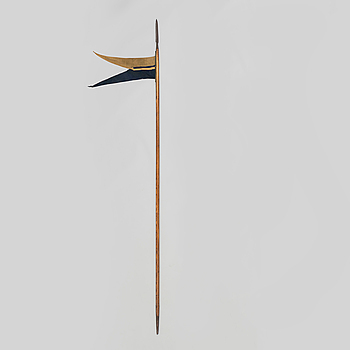 A Swedish second half of the 19th century sabre with scabbard. A Swedish helmet 1887 pattern. A contemporary knife by Adrzej Rybak. A second half of the 19th century sabre with scabbard. SWORD, Dutch/German, the blade from the 1640's, the hilt possibly later. A British over-and-under flintlock pistol circa 1800. A Swedish Halberd a so called 1697 pattern. A Swedish artillery officers sabre 1889 pattern with scabbard. A second half of the 19th Swedish century sabre with scabbard. A Danish sabre for the artillery 1802 pattern.